Shares of South Korean firms with business interests in North Korea gained a huge boost on Thursday in Seoul markets after U.S. President Donald Trump’s announcement on Tuesday (local time) that he will hold a second summit with North Korean leader Kim Jong-un at the end of this month. Seoul bourses reopened on Thursday after a five-day hiatus due to Lunar New Year holidays. On expectations of possible infrastructure projects in North Korea, shares of local cement manufacturers rose sharply. On the main Kospi market, Ssangyong Cement Industry surged 29.9 percent to close at 7,690 won ($6.84), Sungshin Cement jumped 13.21 percent to 15,850 won and Asia Cement 4.10 percent to 139,500 won. Stocks related to construction and railway equipment were also buoyed by the news. Shares of Ilshin Stone were up 24.84 percent to finish at 3,795 won, Ilsung Construction 19.27 percent to 2,290 won, Hyundai Engineering & Construction 7.28 percent to 229,000 won and Hyundai Rotem 3.52 percent to 29,400 won. Commercial nuclear-related segment also gained on the possibility of denuclearization of North Korea. Kosdaq-listed Orbitech shares gained 16.14 percent to finish at 7,050 won and Woori Technology 14.02 percent to 1,545 won. 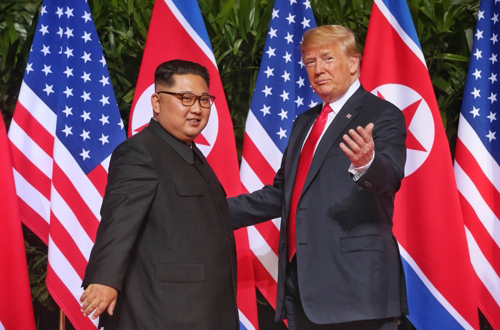 President Trump announced in his State of the Union address that he will have his second summit with North Korea’s leader Kim on February 27-28 in Vietnam. The two heads had their first face-to-face sit-down in Singapore in June last year, where Kim pledged to complete denuclearization of the Korean Peninsula. But the market gave into skepticism amid follow-up reports about the still-wide differences over the denuclearization terms. On Friday, shares of Ssangyong Cement fell 0.72 percent to close at 6,910 won, Sungshin Cement tumbled 0.68 percent to 14,550 won and Asia Cement 1.08 percent to 138,000 won. Ilshin Stone stocks were down 2.37 percent to 3,705 won, while Ilsung Construction rose 3.71 percent to 2,375 won. Shares of Hyundai E&C fell 1.08 percent to 64,300 won while those of Hyundai Rotem were up 0.51 percent to 29,550 won.